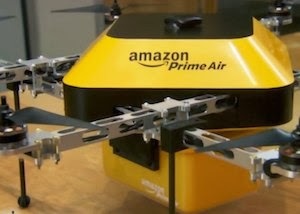 Amazon Drone Delivery: Technological Leap or Privacy Invasion? Jeff Bezos is a man who loves to be misunderstood. Selling Kindle devices with little profits, the man behind the shopping company behemoth Amazon makes it look as if he has pulled some sort of a magic trick on his investors. The company takes so many risks; in fact, many rumors suggest that the company still isn't profitable; however, investors have been banking on Amazon for years. Much to every MBA's surprise, Bezos runs with a business model that's completely unique. He loves taking risks, and yes, he thinks out of the box. Taking his famed consumer-first approach, last year Bezos unveiled an innovation that can be seen as the beginning of a new era of technology. The robot-driven future that we all dream about when we were kids is finally here as Amazon plans to bring drone-delivery to its customers. This means that instead of a human delivering your shipment, you will now have a drone flying right to your doorstep, dropping the box, and buzzing away to the Amazon warehouse. Amazon Prime Air, the shipping giant's move into robotics is designed to help cut the manual labor that is required to drop small objects like CDs or small computer parts. Though the idea looks good on paper, it raises some serious concerns about privacy. Drones are flying in your backyard, equipped with a camera, thereby taking away your privacy. Though on the outside Prime Air looks like a technological marvel, it comes with its own flaws. Let's take a look on the pros and cons. Prime Air is a great example of Amazon's consumer-oriented innovation. The company is well known to aggressively focus on delivering the best quality to its customers, and drone delivery is simply a by-product of that vision. Not only does it save time and labor for Amazon, it's also ensures that you get your product within just an hour. So, instead of running to the supermarket to buy a toothbrush, Amazon Air will fetch you your item using its robotic drone. Furthermore, Prime Air also opens a gateway for other companies to innovate in robotics. Robotics is an area that has millions of enthusiasts. For them, drones going mainstream would be a good news as it will give them a good incentive to start innovating more. In other words, Prime Air is the innovation the tech industry needs. "The issue of concern, Mr. Speaker, is surveillance, not the delivery of packages. That includes surveillance of someone's backyard, snooping around with a drone, checking out a person's patio to see if that individual needs new patio furniture from the company. " Furthermore, not only is the drone surveillance a potential privacy threat, it's also an object that can easily be hacked. Anyone with good computer skills can hack a drone and use it for their own personal gain. This is a big issue not only in terms of privacy but also in terms of security. The FAA has some strict regulations about drones and Bezos will have a tough time getting them convinced that this is possible. Another problem with drones is that they can get stuck into branches thus delaying or having your shipment cancelled. Similarly, there are many problems Amazon needs to overcome in order to make this dream a reality. Though Bezos aims for 2015, we find it highly unlikely that it will be possible that soon. The controversy, however, raises a big issue, can the US government trust its citizen's safety and privacy in a company for the sake of innovation?